Thai police have revealed the identity and passport of the South Africa man who they suspect may be responsible for the brutal murder of a Thai woman on Sunday morning in the northern outskirts of Bangkok. The South African was the only visitor to the woman’s hotel room in the Lat Phrao area at 8 am and left at 8.45 am. CCTV footage showed him to be acting suspiciously. 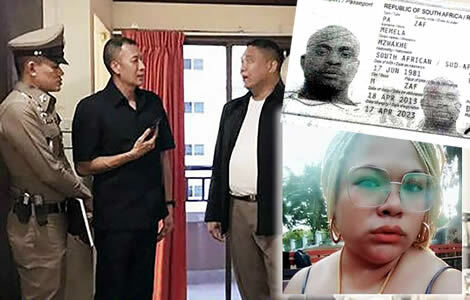 Thailand’s Immigration police have been called in to track down a South African suspect who local police in Lat Phrao believe may have murdered a 35 year old Thai women in her hotel room on Sunday morning. Police are working on the theory that it was a business negotiation that went wrong and descended into lethal violence. 35 year old Susama Reunrit was out late on Sunday morning, returning to her bedroom at 4 am. At 8 am, she had a visitor, a 38 year old South African man, Mzwakhe Memela, who left her hotel room at 8.45 am . Later that morning, hotel staff and a Dutch friend entered her hotel room and found her body on the ground wrapped in a sheet. She had died from a blow to her head. Thai police have released details of the suspect in the case and have called in Thailand’s Immigration police to assist in apprehending him. Thai police are on the trail of the South African national who, it is believed, was involved in the murder of the Thai woman over the weekend. The Thai woman was 35 years old and reported to be from Kanchanaburi Province. It is also reported that Thai police believe the South African whose photo, passport and name have been made public, visited the Thai woman’ room to negotiate some sort of deal involving jewelry. The police believe that during the negotiations, the South African hit the woman on the head. They have named the man as Mzwakhe Memela. The Thai woman was named as Susama Reunrit. She had been staying in a room on the 6th floor of a hotel in the Lat Phrao area on the northern outskirts of Bangkok. The Thai business woman was found by hotel staff when they used a a special key to access her room on Sunday morning last. It appears the woman had been the victim of a brutal attack when hotel staff and a friend found her. Police suspect that Memela went to the room to cut a deal involving jewelry but when negotiations went wrong, he struck and killed her. CCTV footage shows that that the South African was the only person that entered her room and he was seen acting suspiciously when leaving. Hotel staff had tried to make contact with the woman later in the morning to settle the outstanding bill for her stay. When they could not get an answer, staff contacted a friend of the woman, reported to be a man from the Netherlands. He was staying in the hotel room adjacent to the victim. Hotel staff including receptionist Payu Srikhung with the Dutch man used a spare key to gain access to the Thai woman’s room. There, they found her body wrapped in a sheet and lying on the floor. She had beaten to death with a blow to her head. Police investigations have revealed that the Thai woman had booked into the hotel on Saturday night at 9.50 pm. She had gone out for a late dinner and did not return until 4 am on Sunday. CCTV footage from the hotel shows the 38 year old South African, Mzwakhe Memela, entering her bedroom at 8 am. The footage shows he left the room at 8.45 am. Police reports suggest that when he emerged from Ms Reunrit’s room, he walked to the elevator moving backwards while staring at the entrance to the hotel bedroom. Police in Lat Phrao have called in Thailand’s Immigration police to assist in the hunt for the African man who was the only person seen to enter the room during the time frame the murder is believed to have occurred.